Has your child been dreaming of surfing the sidewalks? Or do they want to explore their imagination indoors? Riding toys help children build up their confidence and become more independent. They engage their creative skills when embarking on new adventures and conquests. You may be thinking: How do I choose from the best ride on toys for toddlers when there are so many different options available? Kids Ride Wild gathered reviews on the best toddler ride on toys to bring you the top picks for both outdoor and indoor toddler riding toys. Our comprehensive buying guide will compare all of the important features to help you decide on one that fits your child’s preferences and playtime needs. The Micro Mini Original Kick Scooter is a 3-wheel scooter designed for children ages 3 to 5. Let your little one pick out their favorite color as there are plenty of color options to choose from including yellow, purple, red, blue, green, orange, aqua and pink. This model features a deck that is low to the ground that helps young children to build stability while they are learning how to ride. 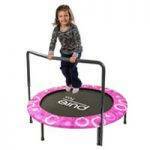 It can hold up to 44 pounds making it a great choice for preschool and kindergarten age children. 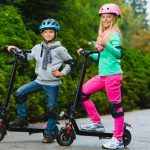 The older kids will most likely prefer more advanced scooters, such as the electric ones or those made for tricks and stunts. With high quality polyurethane wheels, kids will be gliding smoothly on virtually any hard surface. This outdoor riding toy is easy to steer as kids simply lean with their body weight to one side to steer in that direction. Your child will enjoy floating on the sidewalk on this swiss-designed Mini Kick scooter. This is one of the most popular riding toys for toddlers as it is extremely durable with a fiberglass reinforced deck that is suitable for daily use. Your child will be asking to ride on this kick scooter frequently as they will love being able to cruise around the neighborhood sidewalks. As for safety, it is certified by the CSPC which assures parents that it will help their child build coordination in on a safe platform. The total dimensions of this scooter measure at 25.98 x 1.97 x 10.63 inches with a weight of 3.31 pounds which is ideal for toddlers to mount and dismount. Make sure your child is wearing a helmet and protective gear as they hop on to enjoy the riding fun. Among riding toys for toddlers, the Strider – 12 Classic Balance Bike is a great way to teach children ages 18 to months to 3 years how to ride. As they learn coordination and balance, they become more confident about balancing on the 2 wheeled bike. You will be opening up a whole new world of excitement for your little one by introducing them to the balance bike that will inspire their transition to a real pedal bike. With a US patented design and EVA polymer tires, this bike is sure to be a long lasting addition to your child’s outdoor toy ensemble. The high performance frame includes a frame integrated footrest that will safely help your child coast along the pavement outside. It even has a rear braking system to help children to come to a safe stop. The total dimensions of this toy are 28 x 7 x 13 inches and it weighs only 8.9 pounds. The simple, yet stylish toy is loved by both parents and kids with a quick 5 minute assembly. 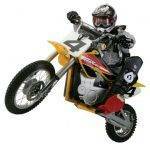 Your child won’t be missing out on any riding time when the package arrives! This bike comes in four different color options including blue, green, pink and red. With a mini-saddle seat, it will be comfortable for toddler hips to ride for hours and parents even have the option of extending the use of this toy to 5 years of age and up to 60 pounds by purchasing the XL seat post. The built-in seat post can be adjusted to the proper height for your child to firmly plant their feet on the ground. What better way to help your child become more independent, then to get them a two-wheeled balance bike!>> Check out Strider – 12 Classic Balance Bike on Amazon right here. The Power Wheels Kawasaki Lil’ Quad is a toddler-friendly kids four wheeler aged 12 months to 3 years. Not only do they learn about cause and effect of pushing the start button, but they will build motor skills and balance as they embark on their riding adventures. The 6-volt battery and charger are conveniently included with the package. Adults will need to perform some basic assembly to get the Lil’ Quad ready for action. Once assembled, kids simply hop on and place their feet on the built-in footrests. With a quick push button start, kids will be riding around outside in excitement on this battery powered ride on. Product reviews boast that this is a top pick out of all ride ons for toddlers. Toddlers can ride the toy outdoors on hard, smooth surfaces and grass at speeds up to 2 mph. 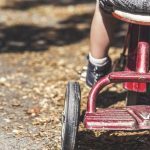 They will feel like they are flying through the wind while parents are assured that the strong wheels are moving at a safe speed for little riders. The total dimensions of the ride on are 27 x 26 x 28 inches and weighs 10 pounds making it suitable for both small and larger sized toddlers up to 40 pounds. It only moves forward which helps kids get accustomed to ride on toys with a simple stop-and-go motion. With a comfortable seat and easy grip handlebars, kids will want to ride the Power Wheels Kawasaki for hours. This toy encourages pretend play for kids to imagine their own adventures as they cruise around on the miniature kids ATV. >> Check out Power Wheels Kawasaki Lil’ Quad on Amazon right here. 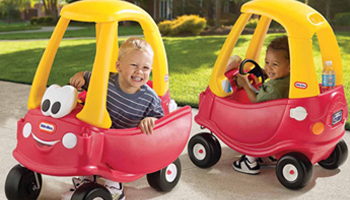 The Little Tikes Cozy Coupe 30th Anniversary Car is a modern rendition of the original best selling Cozy Coupe ride on toy. For generations, this toy has been adored as one of the favorite toddler riding toys for ages 18 months to 5 years. With total dimensions of 29.5 x 16.5 x 33.5 inches, the four wheeled car is a blast for toddlers to explore outdoors. The red car cabin features a bright, smiling character face with large eyes. The new features in this model include a handle on the back for parents to push from the back and a removable floor for little ones to use their own foot power to move around. Kids love the high seat back that is supportive for a comfortable, exciting ride. They bring along their favorite toy with a storage compartment in the rear and tote along their drink with the cup holder compartment. This ride on toy is designed for outdoor use with rugged tires that can ride on any smooth or grass surface. The front wheels spin 360 degrees for kids to turn in all directions either by moving with their feet to the ground or with an adult pushing behind. Children up to 50 pounds can safely ride on this toy. The weight of this car itself is 17.7 pounds which makes it easy for parents to push behind or kids to propel on their own. The Cozy Coupe push car for toddlers encourages imaginative play with an clicking ignition switch and gas cap that can be opened and closed for kids to pretend like they are refilling the tank. This classic coupe is surely one of the best toddler ride on toys for sale this year. The Little Tikes Spray and Rescue Fire Truck can be used for both indoor and outdoor pretend play. Ages 18 months to 5 years can cruise around on this four wheeled ride on toy. It is easy to steer around the house with suspended rubber wheels that are great for both indoor and outdoor surfaces. Your child can imagine they are fighting fires like a firman Sam with a pressurized water tank and hose assembly that squirts out water. When the water runs out, the tank can easily be snapped off to be refilled. This ride on toy is powered by your child kicking their feet to the floor or an adult can push from behind. It only weighs 14.1 pounds which is light enough for toddlers to steer on their own. The front wheels turn in all directions for the fire truck to be maneuvered around obstacles inside the house. Reviews on ride ons for toddlers rave about how adorable the smiling face of this red truck is with it’s big grin and bright eyes. Assembly of the truck takes only a few minutes and kids will be dying to hop on and play pretend firefighter games. Once assembled, the total dimensions measure at 31 x 17 x 16 inches which is plenty of room for your toddler to sit inside. Children will get plenty of excitement from this toy as it will last for lots of playtime with the durable plastic cab and large wheels. Help your little firefighter save the world with this exciting ride on fire truck! Fisher-Price created the Power Wheels Thomas and Friends ride on toy to inspire young children to embark on train adventures around the house. The train comes with 18 feet of locking tracks that can quickly be assembled for children to ride around in a circle. If your child wants to ride around freely and steer on their own, the ride on can come right off the tracks. The size of the toy measures at 27.8 x. 13.1 x 17.4 inches making it ideal for children ages 12 months to 3 years. 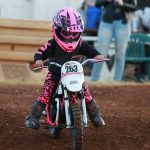 The 6 volt battery powers the speed up to 1 mph on the track and 2 mph off-track which is a safe cruising movement for toddlers. The package comes included with the 6-volt battery and charger, after some simple assembly the toy will be ready to ride! Kids simply press the push start button and will be riding with Thomas the Tank engine. They can activate phrases and sounds from Thomas and friends with the yellow whistle button. The 1 AA battery required to power the sounds also comes included in the package. This ride on train will have everything your child needs to ride for hours of fun. Great battery life is a definite plus so your child doesn’t have to miss out on any play time. The circular track helps them to build their confidence in steering before taking the train off the tracks. With a sturdy design and comfortable footrests, this Power Wheels ride on train will surely be one of your child’s favorite toys. >> Check out Power Wheels Thomas and Friends Thomas with Track on Amazon right here. The John Deere Sit ’N Scoot Activity Tractor is a toddler ride on toy perfect for your little farmer. Recommended for ages 12 months to 5 years, this ride on tractor is a blast for toddlers and young children to let their imaginations run wild. Kids press the horn on the bright yellow wheel to hear the traditional “Old Mcdonald” tune powered by 3 AAA batteries. Parents love being able to control the volume with normal, low and off settings. This toy is powered by foot to floor action as children can build their balance while kicking the floor to move forward. The walk-behind bar can be used for adults to push their children around or it can be removed for more independent riders. Whether your child is scooting on their own or simply holding on for the ride, they will love this bright green ride on tractor! Kids love using their imagination while they play with the four farm animal characters included with this ride on toy. With a pig, sheep, horse and cow, the John Deere Activity Tractor is packed full of entertainment for little ones to engage in pretend play. The miniature animals have fun places to hide as the ride on tractor seat opens out to a play set when your child has reached their destination. They even make cute sounds when they are placed in their special compartments. Not only is this toy loads of fun but it is extremely lightweight and easy to move around weighing at only 5.6 pounds. Kids enjoy sturdy and comfortable play with all of their farm animal friends on the John Deere Activity Tractor. We liked the tractor so much that we’ve included it in our best ride on tractor picks right here. >> Check out John Deere Sit ’N Scoot Activity Tractor on Amazon right here. The Bouncy Inflatable Hopping Horse is a ride on toy with a realistic plush feel for children ages 12 months to 3 years. The toy arrives with a two-way hand pump that inflates the horse within minutes for kids to hop on for hours of playtime. Instead of the traditional rolling wheels, this horse helps children build their balancing skills with a unique bouncing motion. Kids simply grab onto the extra long ears and off they go to bounce around the house. Not only will they learn coordination on this ride on toy, but they will burn off plenty of energy hopping up and down. Durable enough to withstand hours of play without needing to be re-inflated, this horse is perfect for wild toddlers to ride on. Kids love the comfortable cloth outer shell that surrounds the 12 x 10 x 6.5 inch inflatable horse. The fabric resembles a microfiber material that is soft to the touch and keeps the inner core protected from puncture or damage. The brown color closely mimics the coat of a real life horse! We’ve included this toy amongst our best rocking horse toys picks also because it’s super lightweight, weighing at only 3 pounds which makes it easy to move or push around the house. It is surely one of the most portable ride ons for toddlers as it can be deflated for easy storage or travel. Toddlers up to 35 pounds can easily climb on to the horse’s back to enjoy the bouncing fun. Let your child imagine riding a real horse as they hop on Bouncy’s back. >> Check out Bouncy Inflatable Hopping Horse on Amazon right here. With such a wide variety of toddler riding toys available, you will need to find a toy that fits your child’s imagination and preferences. As a parent, you know your child best and can decide on what type of play that will keep them occupied for hours. We’ve compiled a series of different playtime scenarios and will help you to pick out the best ride on toy for your little one. If you want your child to develop balance and coordination for outdoor play, the Micro Mini Original Kick Scooter and Strider Balance Bike are both great choices. The Micro Mini Kick Scooter gives children added stability with a large deck and three wheels. Kids are low to the ground which makes it much easier to learn how to ride. The Strider Balance Bike is designed specifically to help kids build coordination and transition to a real bicycle. The frame has a built-in footrest for toddlers to cruise around the driveway with ease. For kids who want to speed around the neighborhood, the Power Wheels Kawasaki Lil’ Quad will take them on a wild ride! 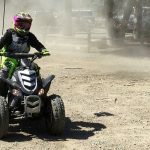 This battery powered ATV for kids ride on goes up to 2 mph which is a safe speed for toddlers, so parents can be assured their child will not fly off the toy. Kids are full of excitement when they hit the push start button and take this toy cruising outdoors. Instead of putting your child in the cart when going on a grocery trip, take them along in the Little Tikes Cozy Coupe. With a removable floor, toddlers can develop their sense of independence by propelling themselves with their feet on the ground. You can also use the attached handle to push your child from behind. If your little one loves pretend play and wants to fight imaginary fires, the Little Tikes Spray and Rescue Fire Truck will bring their dreams to life. Kids can ride around on the big red truck and even spray out water with the attached water hose and built-in tank. Your child will feel like a hero as they are riding around the house imagining that they are saving lives! For preschoolers and kindergartners who love watching the Thomas and Friends television show, the Power Wheels Thomas and Friends ride on toy will be their new favorite toy! This four-wheeled ride on can take kids for a fun-filled train adventure. Kids who enjoy working on the farm with dad and grandpa will want to take the John Deere Sit ’N Scoot Activity Tractor for a ride. This toy resembles a real John Deere tractor with it’s bright green design and durable wheels. Kids will even be able bring along their barnyard friends with the 4 included animal characters that fit into the pop out activity center. For little girls who love horses, the Bouncy Inflatable Real Feel Hopping Horse is the perfect gift. This soft ride on toy is great for little ones to burn off energy while bouncing on top of their favorite animal. There are also toys like the ride on dinosaurs, for little Jurassic Park fans out there. Whether your child enjoys pretend to play or you simply want to get them ready for a real pedal bike, ride on toys will give them plenty of excitement for early childhood. The best ride on toys for toddlers are both safe and durable for plenty of riding excitement! We’ve shared the best toddler ride on toys for you to confidently choose a toy that your child will cherish for years.